Earn 175 - 295 points upon purchasing this product. Use 1750 - 2950 points to purchase this product! 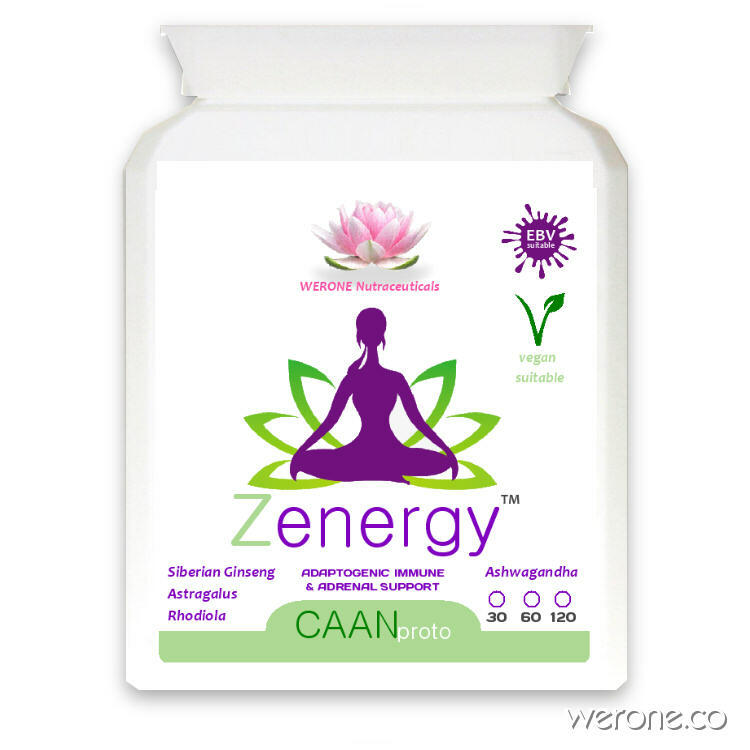 Zenergy is an organic adaptogenic herbal formula designed to reduce stress, restore immune functions and help you feel more energy. This complex has been created with a view to also being useful for those dealing with Epstein Barr Virus. Adaptogens are the perfect natural solution, they are a special class of plant herbal medicines used in ancient Ayurvedic and Chinese medicine for centuries to promote a sense of wellbeing. In those traditional healing systems, these plants are considered the ‘Kings’ and ‘Queens’ of herbs for restoring health, vitality, immunity, stamina and promoting longevity. As natural cortisol-controlling compounds, adaptogens are a powerful and effective solution for counteracting the harmful effects of stress, because they help balance stress hormones such as adrenaline & cortisol, adaptogens are a powerful tool for people that deal with persistent stress or fatigue. Astragalus is an adaptogenic herb, that has been used as a traditional chinese medicine for thousands of years. This herb helps your body to adapt to stress and brings your body into equilibrium. It is a very powerful immune booster that prevents colds, flus and upper respiratory infections because of it’s anti bacterial properties. Astragalus is believed in the Orient to strengthen muscle and support metabolic functions. One of the most important herbs in the world, Astragalus has been recognized as a superb and potent tonic by modern researchers aswell. Ashwagandha is one of the kings of indian herbs. It has a calming effect by reducing the effects of stress, it’s known to reduce panic attacks by increases of GABA, it increases the libido, blood count and hair melanin. Useful with many health conditions such as auto-immune disorders and may inhibit tumor growth. Ashwagandha may also be effective when used synergistically with alcohol to reduce stress and anxiety, although I think you’re better off skipping the alcohol or at least choosing a clean one and mitigating its harmful effects when you’re stressed. Another cool thing about ashwagandha is that it shows promise in improving memory formation. This could be important in research for treating Alzheimer’s patients. More large human studies are needed to show how and why this might be effective, but there is research to suggest that ashwagandha could reverse the effects of neurological toxins associated with neurodegenerative diseases. Studies show that if you take rhodiola for longer periods of time, it helps even more.There does appear to be a bell-curve response, so finding the right dose matters, and mega-dosing is counterproductive. It can also have a slightly stimulatory effect, so it might be better to take in the morning. Some people find it helpful when trying to go off of caffeine. Rhodiola is a superb herb for people who work very hard, either physically or mentally. Rhodiola has been shown to improve endurance and mental capacity, including memory enhancement. It has been shown to be a superb tonic and energizer for those into physical fitness, and a superior tonic for those stuck behind a desk or at a computer terminal for long periods of time. Consumption of a small amount of Rhodiola extract significantly improves a person’s capacity to absorb and utilize oxygen. Rhodiola is especially beneficial to those who live under stressful conditions. It has been shown that Rhodiola reduces the body’s stress reactions, and thus relieves moderate mental stress as well. People stay focused and suffer far less from fatigue even under stress. It is the ideal herbal supplement for the modern world. It also supports immune functions. There’s also plenty of evidence to show that rhodiola will improve cognition, independent of fatigue-reduction. A study on the effects of rhodiola on physicians on night duty fatigue showed that the herb could improve performance by about 20%, regardless of fatigue levels. Rhodiola could also improve your mood and decrease the symptoms of depression. Improvements in feelings of well-being might be, in part, caused by rhodiola’s effect on serotonin levels. Traditional healers have used Siberian ginseng (not to be confused with panax ginseng) to fight fatigue, maximize physical performance, and improve overall immunity and longevity. Research backs their practices. Looking to up your endurance? In one study, Siberian ginseng increased subjects’ time to exhaustion by more than 500% . Other research shows that it can improve resistance to both cognitive and physical fatigue. There’s also promising evidence that this adaptogen has immunity-boosting effects and can increase t-cell count. Suggested Use: One to two capsules in the morning without food. Cautions: Not suitable for pregnant or nursing mothers, avoid for those with bipolar depression, manic behavior or if taking pharmaceutical sedatives and pain medications. This powder comprises 4 ingredients, Spirulina, Wild Blueberry, Barley Grass Juice Drink & Atlantic Dulse. Without a healthy liver, you cannot thrive, or in many cases, even survive. The body’s second largest organ, your liver carries out numerous functions to boost well-being, many of which are related to digestion, metabolism, immunity, the storage of nutrients within the body, and the big one - detoxification. These functions make the liver a vital organ, necessary for providing energy and nutrition to tissues which would otherwise die. fights free radicals promotes anti-ageing strengthens memory increases cellular energy assists liver phase2 detox Most alpha-lipoic acid supplements include equal amounts of the (R) and (S) forms. However, only RALA is found naturally in the body. RALA is a unique cofactor in energy production and helps regulate glucose and lipid metabolism. RALA promotes the synthesis of glutathione and the induction of Phase II liver detoxification enzymes. Klamath Lake Blue Green Algae [BGA] has the highest beta carotene content per gram of any food a provitamin that boosts the immune system and scavenges free radicals that can cause oxidative damage in the body. Klamath blue green algae is a high source of Canthaxanthin and completely toxin-free due to unique filtering and processing systems used. BGA provides one of the only vegetarian sources of vitamin B12, providing 133% of the RDA. BGA contains 60% high quality protein. Highest beta-carotene content per gram of any food - a provitamin that boosts the immune system and scavenges free radicals that can cause oxidative damage in the body. BGA is the richest known source of chlorophyll, which can help our bodies in cell regeneration, blood purification and general detoxification. Astragalus root is a natural ingredient that is found in many natural medicines and various supplements because it has so many benefits. We’ll look at the benefits and risks of Astragalus root, but first let’s look at the research related to the anti aging benefits – it’s impressive and exciting.